Havin' a hard time making it through Wednesdays? Then the last bastion of bluegrass stompin', country callin', folky strummin', and poppy shoutin' is offering you a remedy. Yes ladies and gents, the LaurelThrist Public House is allowing the gal and guys of The Ascetic Junkies to set up shop every Wednesday evening for a few rounds of happy drinks for happy hour and a happy time. But these kids don't play alone, they've brought friends! Each week they’re collaborating with a new artist displaying honeyed originals, twangy, traditional bluegrass, ramblin' covers, and maybe even a testin' the pluckiness of new some material. And if that's not enough to get ya in the door, singer/glockenspieler Kali Giaritta is feeling generous and giving away their latest EP Don’t Wait for the Rescue Squad on Bandcamp. “These songs are like gifts to friends, so we felt silly charging for them. Enjoy!” says Kali. 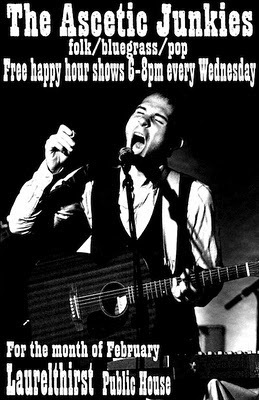 Have happy music and happy friends at 6 PM every Wednesday in February with the Junkies at the LaurelThirst. Read this article on The Deli Portland. van go lion make electropop debut at ash st.